In his emotional acceptance speech, Vikku thanked and credited everyone who was responsible for making him what he is today. CHENNAI : An array of ghatams neatly arranged on stage, and a hall filled with restless rasikas waiting to get a glimpse of ghatam maestro Vikku Vinayakram set the tone for a momentous event on Wednesday. The Grammy recipient was conferred with a Special Lifetime Achievement Award by The Music Academy, making him the third artiste to receive this special award. 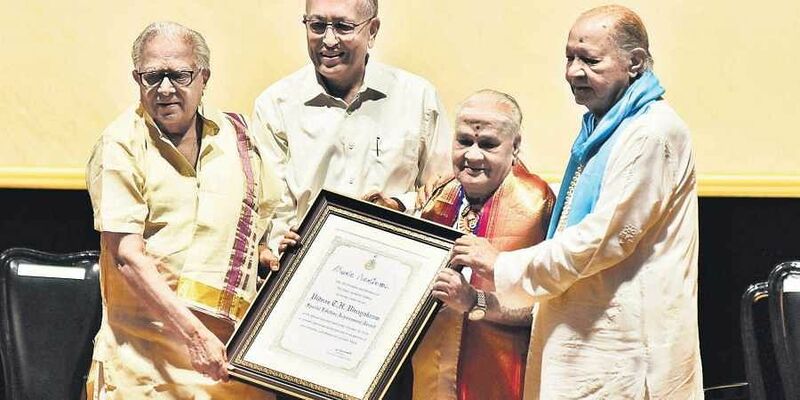 “Eminent Bharatanatyam dancer Kamala Lakshmi Narayanan and violinist Lalgudi Jayaraman are the only artistes to have been presented with the award, and now the ghatam exponent joins this illustrious list,” said N Murali, president, The Music Academy in his speech. From playing alongside MS Subbulakshmi, becoming a part of John McLaughlin’s group ‘Shakti’ along with Zakir Hussain, touring internationally, being a part of international drummer Mickey Hart’s album Planet Drum to becoming the first south Indian musician to be awarded a Grammy, the septuagenarian has several achievements. Yet, he remains grounded, with a lot of faith in his music. In his emotional acceptance speech, Vikku thanked and credited everyone who was responsible for making him what he is today. “My father trained me in the instrument, and his goal was to make the ghatam famous across the world. I took it upon myself to accomplish his dream. Today, as I stand here with this award, I don’t look at it as mine...it is a recognition to the art, the instrument and the music,” said the 76-year-old who performed a special percussion programme — Guru Laya Samarpana with his prime disciples, as part of the function.